Regular readers of my blog will know that I have been campaigning for years to improve how planning is handled by Labour-run Reading Borough Council. I am going to write a series of posts about the campaigns as there is lots to tell. The point of S106 monies (paid by developers to the council) is to ameliorate the negative impact of a development for local residents in the area. Planning permission is refused unless the applicant/developer signs the legally-binding S106 agreement between the authority and themselves (where a S106 is deemed necessary against the criteria to make the development acceptable in planning terms). Back in November 2009 Conservative councillors and I raised concerns with the then Director of Planning over the lack of accountability and the need for a robust system to handle Section 106 developer contributions (S106). Investigations revealed that the then Labour-run administration had little interest in how S106’s were recorded or allocated, that departments had wildly varying standards of recording these financial contributions and that a number had been misused. S106’s are given to the council by developers to deal with the impact on the local community surrounding each development. Examples of how S106’s may be used legitimately are: increasing the capacity of the local school, providing new benches or play equipment to the nearby park - thereby reducing the extra pressure and making the development sustainable. Under the Conservative-led administration 2010-11 a new single system of properly recording and tracking S106 contributions was introduced. Following a lengthy internal investigation, my paper entitled RBC’s Usage and Accounting of Section 106 Receipts, and our Coalition partner's - the Lib Dems' - support, Council officers agreed to call in an outside team from Wokingham Borough Council for an independent investigation into past practices and to make recommendations for the future. The report made a number of “High Priority” recommendations to address the failings of the earlier Labour administration, some of which our local Coalition administration had implemented already. Back in February I was concerned by the questionable way in which Labour councillors decided a planning application. After looking into the matter I campaigned put pressure on the administration to provide training as soon as possible. I highlighted that contrary to Reading Borough Council’s constitution (which stipulates planning training is mandatory), not even half of the Committee had received any training. 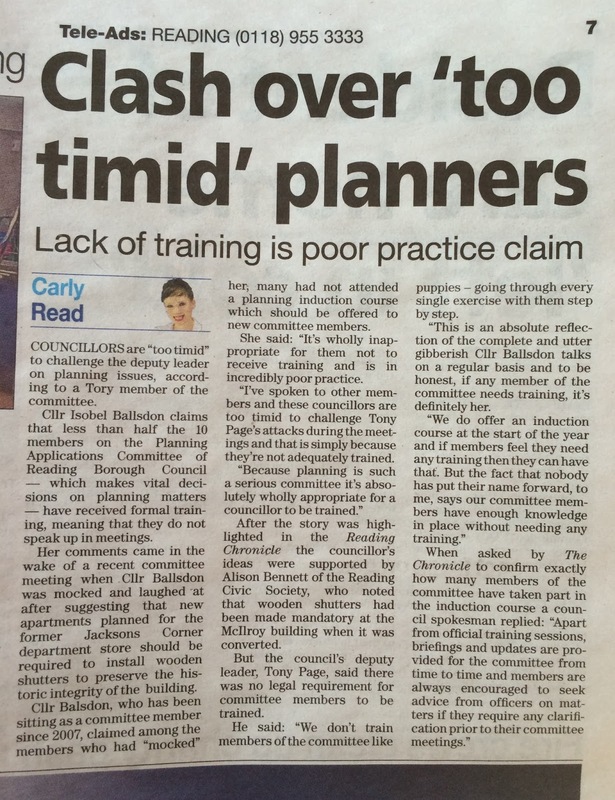 In fact no training had been provided for a couple of years, even though requests had been made by opposition councillors. The fact a response was not forthcoming to my concern that RBC was exposing itself to the possibility of legal challenge speaks for itself. 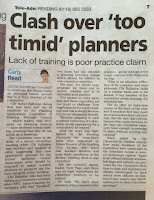 I am pleased though that common sense prevailed and RBC reinstated planning training in June. Could it be Labour wanted to avoid a headline in the run-up to the Elections more than avoid possible legal action by discontent applicants? Readers may draw their own conclusions as to why, after I’d raised the danger and potential cost this could have on the validity of planning decisions, Labour chose to let three Planning Committees meetings and the Local/General Elections take place without providing the constitutional councillor training.